Sponsored by General Mills through MyBlogSpark. 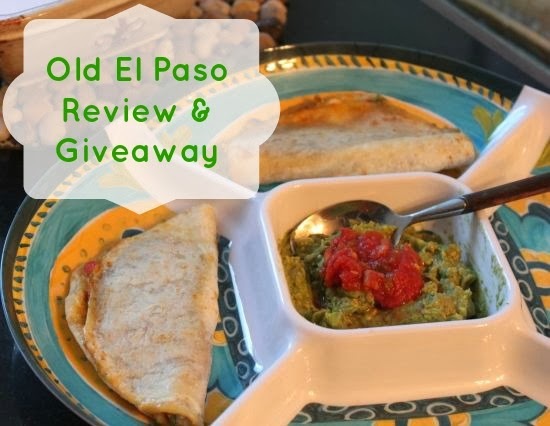 I was provided with a beautiful food and dip platter, along with a Gift Card to Publix to showcase the new frozen Old El Paso meals. I chose the Chicken Quesadillas frozen meal for two, and they were really tasty. As far as frozen foods go, I was pleasantly surprised. I microwaved one and then took one and half nuked it, followed by a quick fry in the cast iron pan to get that real Quesadilla feel. As recommended by Old El Paso. I have to tell you that method is far more tasty. Microwaved was good, but if you want that authentic crispy taste, you need to do it that way. I whipped up some of my simple guacamole dip topped with fresh salsa and it went absolutely perfect with the Old El Paso Quesadillas. The contrast of hot cheesy crispy goodness with the cool guacamole and salsa was scrumptious. I love this platter. It's a unique dining decor that I haven't had the pleasure of serving on until now. It is perfect for chips and dip and other snacks as well as a 4 person meal. Perfect to take on picnics too. It has an authentic artsy Mexican feel and will be great for dinner parties. Especially when serving any mexican cuisine like this. I'm going to enjoy using it further! There is a coupon you can grab up until October 25th good for $1 off any one Old El Paso product! Find it in your store flyer or go to coupons.com. You can also get .60 cents off on coupons.com when you buy any 3 Old El Paso products! Stack up those coupons! I definitely recommend you try these New Frozen versions. They have beef, chicken and many varieties to choose from! Find out more about the tasty entree's inspired by authentic mexican cuisine and keep up with promotions, by visiting their social media sites! Would you like the same gift pack to stylishly serve up your own? Enter the giveaway ! I am a huge fan of mexican. yes i love mexican food. i always joke that i must be part mexican. Yes, I love Mexican food, especially spicy varieties. Yes, love Mexican food. Enchiladas with lots of cheese are my favorite!! Yes I love Mexican food!! Yes love it! Esp. tacos and fajitas. Yes, I do! Carne asada is my fave. I LOVE Mexican food! I grew up near the Mexican border. I usually make some Mexican type food, 4-5 times a month. Yes, I love Mexican food! I do. I love all the different delicious choices. Yes, I love Mexican food.